Residents of this contemporary home in Koriyama, Japan, squeeze out every cubic inch of storage, courtesy of a centuries-old design concept. Photo by Osamu Abe. Image courtesy of Copyright:ave. 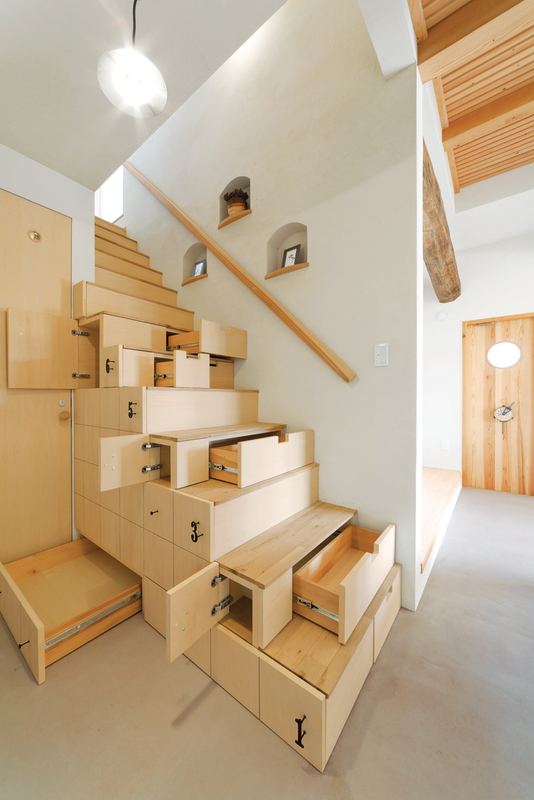 In traditional Japanese houses, clever carpenters often combined staircases with storage to maximize living space. This project in Fukushima Prefecture inspired Nihonmatsu-based architect Kotaro Anzai to borrow the approach and create a custom-built kaidan dansu, or staircase cabinet, to connect the living room to the second story of a 1,078-square-foot home. “We were able to create a clean, uncluttered space, but in a playful way,” says Anzai. He gave the stairs a sleek, modern look by using attractive linden plywood for the main sections and sturdy ash for the treads. He then affixed number-shaped handles to help organize the cubbies. The residents, a thirtysomething couple, stash their favorite ceramic dishes and sake cups inside for easy access when friends stop by for dinner or drinks. However, Anzai didn’t design the cabinet to fit the couple’s existing pottery collection. “I started by designing a strong staircase and divided the remaining interior space into storage. The residents have gone out and found dishes to fit particular spaces. It’s their treasure chest,” he says.